People keep on fighting and blame each other for the disparity of the society. No One thinks let me Change It. Why not uplift the society at its base level from its roots, by changing each individual? So the “One change that I want to implement for uplifting the society” would be- Let us change our self and attitude towards everything. I we change then we promote others to change and gradually it keeps on passing by hence changing the society. Instead of spending lakhs of rupees or amending multiple laws or punishing criminals which are useless at some point, let’s all change us. Because Change happens when there is a disparity in the society or people want to uplift the society. It’s a very simple idea and an easy one; it does not need years of learning or practice. We should follow basic etiquettes, moral values and set an example not for us but for others so that others follow and change the way of life. How can it impact us? Yes, just 3 ways which are simple but the impacts are huge! The way we think, the way we react and what we do for others that matters, not what we do for only us. Humanity stands for who care for all but not themselves. Humanity stands for those who are ready to die for others. Humanity is for those humans who are ready to change the society. How to Implement a Change? Instead of telling students to learn and by heart the formulas for exams, they can be thought in such a manner where they are thought to be proper human with humane values. It doesn’t matter if you have a colorful degree or not, What matters what quality you have and What makes you!. If a criminal, is said given punishment, he should not take it as a curse of punishment but as a boon in which he got a second chance to change himself. These all human values should be taught at a young age, where it will be remembered for a lifetime. 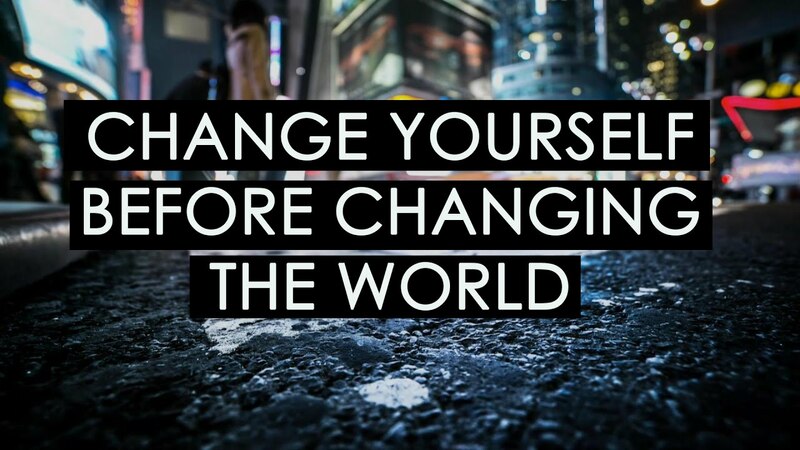 How can a small change, change the big world? Let’s see all the problems that our society faces and how we can implement a change. Cleanliness– If a person feels from bottom of his heart that the wrapper he has thrown on the ground and feels guilty of doing such deed. He will pick it up, put in his pocket, and throw it in the dustbin nearby. If he/she changes the way of thinking and knows the truth, he won’t litter again in his life. Corruption- If a person takes bribe knowingly or unknowingly, should at least think that the bribe he has taken is not right or not a civilized way of earning, he won’t take bribe again. A silent spectator seeing all these ignores these he is no less than a criminal, but if he goes quietly and tells to the briber, telling it’s not correct, it will make a huge difference. If he/she changes his/her mind and doesn’t let anyone else do it, it’s a huge change. Poverty– If a wealthy person has enough and is the greed of more; he gives away his excess to the needy. It will be more humane than what he has. It is not about what we have, it’s about what we give! Terrorism– Lets all change by spreading love and affection instead of hatred, irrespective of gender, caste, race, religion, creed, nationality, etc. Love is peace and peace is love! Discrimination– We all is humans, let’s all change our thoughts about the inequalities, but celebrate our inequalities because it makes us unique! Exploitation against child and woman– If a person thinks, what I am doing is wrong he will never ever do anything wrong, but instead, he will respect women and children, no less than a god and goddesses. If a person changes the way he sees, thinks and reacts towards others, it will make a huge difference and not only change him/her but the whole society and the whole world. What is needed is a small amount of change and a huge amount of impact to uplift the society and cherishes it! And if he thinks that he has the knowledge that he changed himself, of course, he will change others too! From this, we got to know that, “Small changes cause evolution and small evolution causes bigger Revolution”. I hope I changed your mindset and hope you changed yourself and your attitude! Author Bio : Rutajit Sarkar, 15 years old Boy from Bangalore. A participant of International Essay Competition, Month of August.